The Priestess of Sacred Marriage helps balancing your inner feminine and inner masculine archetypes. Do you desire to find a new love or strengthen your current relationship? No matter if the issue you are dealing with is outer or inner, the Priestess of Sacred Marriage can help you harmonise your inner feminine and inner masculine. When both are in balance then the so-called sacred marriage can occur – a complete balance of dualities in a harmonious union. Once your spirit is in harmony, it will naturally attract or better your romantic experiences. The most significant signs that your inner masculine needs your attention to are extreme sensitivity, emotional instability, anxiety or a lack of confidence. You might need to learn to stand your ground. If your inner masculine is out of balance, then this priestess is guiding you to honestly and bravely address the real issues instead of focusing on how other people or situations make you feel and why. The most significant signs that your inner feminine needs your attention to is an excessive focus on material matters and on achieving, winning or succeeding. You might need to learn to focus more on your intuition and on expressing your emotions. If your inner feminine is out of balance, then this priestess guides you to follow your heart instead of reason. In order to receive personal insights about the sacred marriage, try surrounding yourself with hexagonal patterns and shapes, the hexagram or the Double Tetrahedron, which are known as the harmonisers of the masculine and feminine principles. For balancing the feminine archetype, try to work with a triangle or tetrahedron facing down and/or call upon a female deity such as Freya, Hathor, Aphrodite, Venus, Aine, Isis and many others. For balancing the masculine archetype, try working with a triangle or tetrahedron facing up, and/or call upon a masculine deity such as Cernunnos, Kupido, Satyr, Faun, Pan and others. For balancing both, try calling upon Hermes, archangels Gabriel, Chamuel or Raguel. Ideally, perform this ritual when the moon is in a dual sign such as Gemini, Libra or Pisces. You’ll need a quiet, calm place, a set of two candles and a set of two objects which represent the divine duality of sacred marriage. It may be two talismans, two stones or a set of earrings – anything that you like and that you can keep by your side after you complete the ritual. “Please, (the name of the deity or deities you want to work with), help me understand what my divine feminine and/or divine masculine needs right now. “Please, (the name of the deity or deities you want to work with), help me achieve inner balance and harmony, so that I can deeply appreciate the dual principles of my personality, spirit and soul. Hold the set of objects that represent the sacred duality, and using your finger or your imagination, draw a triangle facing up on the one that is to represent the feminine archetype and a triangle facing down on the one that is to represent the masculine archetype. 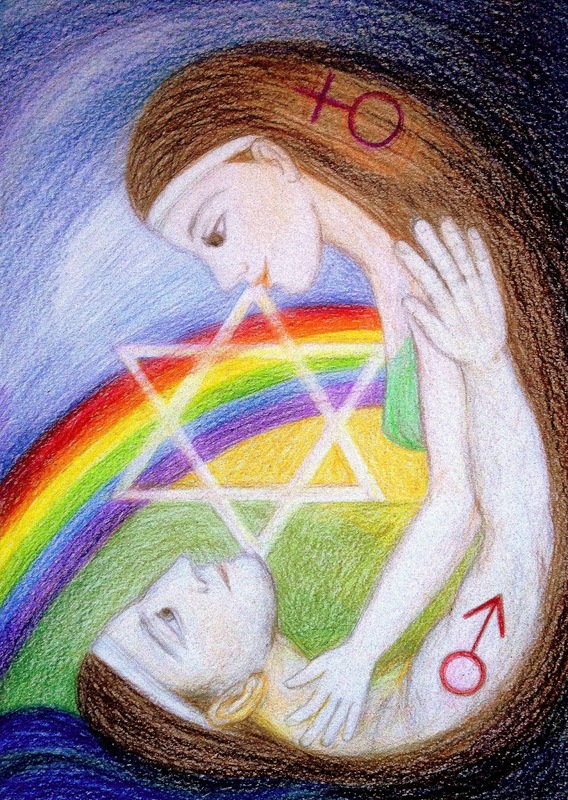 “I charge these two objects with the balanced unity of feminine and masculine energies. May they keep reminding me of the harmony between both of these natural, powerful archetypes.